This post may contain affiliate links or banners, but all opinions are my own. Read my full disclosure statement here.From the beginning I knew that I wanted simple, elegant save-the-dates. I also knew that I didn’t want to spend a lot of money, so I decided to make them myself. 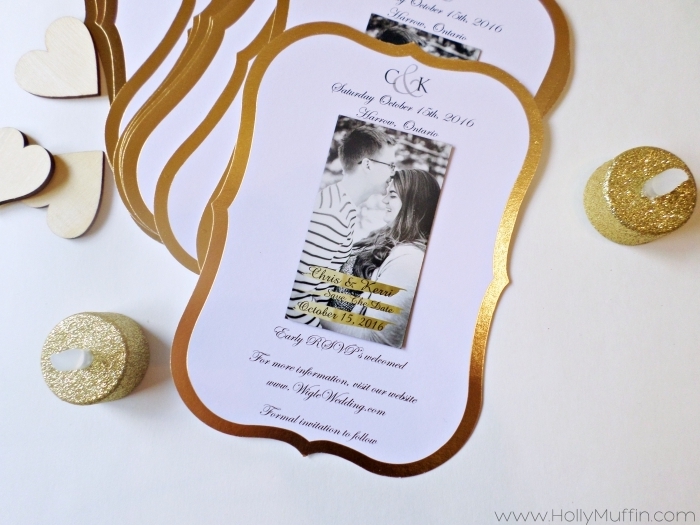 I brainstormed a lot of ways to incorporate gold (ribbons, glitter, etc. ), but when I stumbled across these gold cards at Michaels, I knew exactly what I wanted to do. 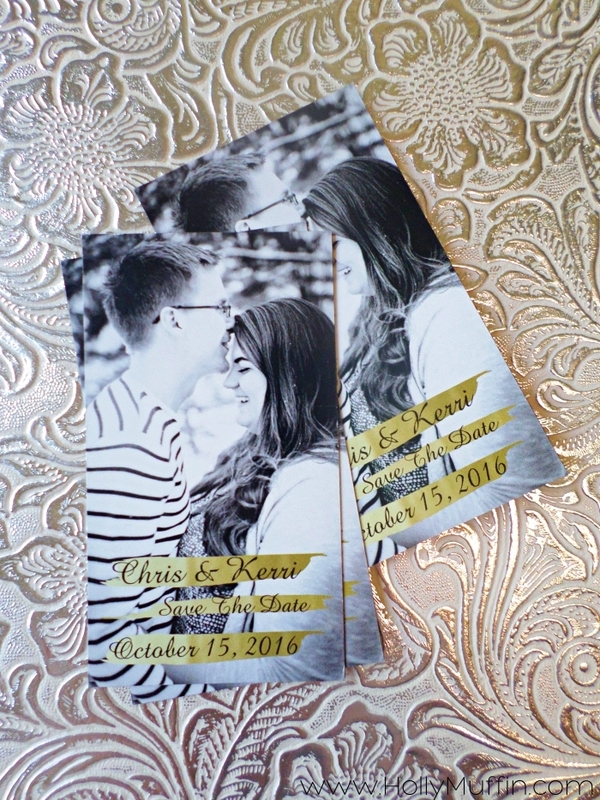 After lots of research, I realized that ordering business card magnets from Vistaprint was significantly cheaper than ordering wedding postcard magnets. Yes, they’re smaller, but who really wants a giant magnet on their fridge anyway? Not me. The business card magnet designs aren’t laid out to be save-the-date magnets, so I played around with fonts and designed my own. If you want to save money but aren’t willing to give up the idea of magnets, this is the way to go.Click here to check out current deals at Vistaprint. After we received our magnets, I used Microsoft word to type out the cards. I was scared about the whole printing at home process, but it went incredibly well. I printed all of the cards in 15 minutes, and then attached the magnets. The Zots glue dots held the magnets on perfectly, and didn’t damage them when pulled off the card. To go along with our save-the-dates, we created a custom wedding website on theknot.com. The wedding website builder is an extremely useful tool. It was extremely easy to design, edit, and customize. We ended up purchasing our own custom domain www.WigleWedding.com (now expired as we only paid for 1 year) so that we could include it on the physical save-the-date cards. I highly recommend doing this as we had several people RSVP via the website. Check out a preview below! 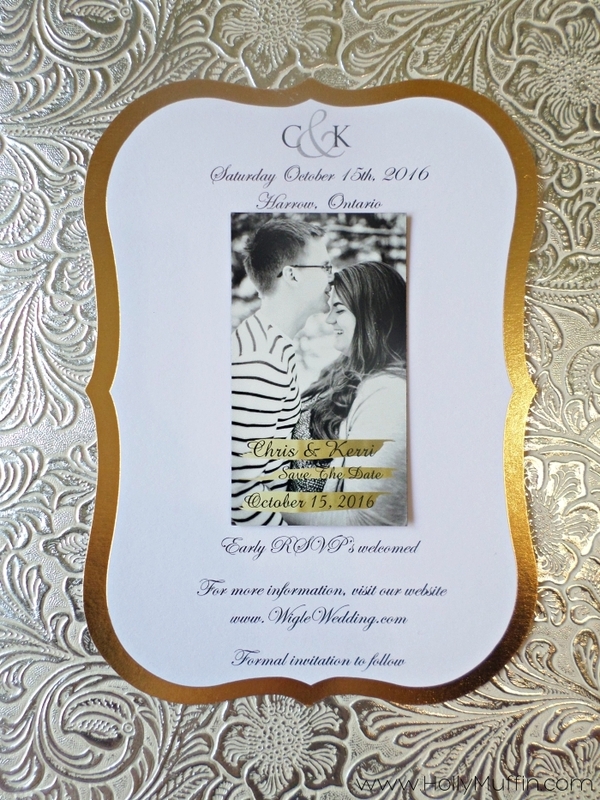 Click here to see our wedding website.If you’re not into DIY but love the look of our save-the-dates, check out Shutterfly. They offer tons of options very similar to ours. Click a photo to see your options! 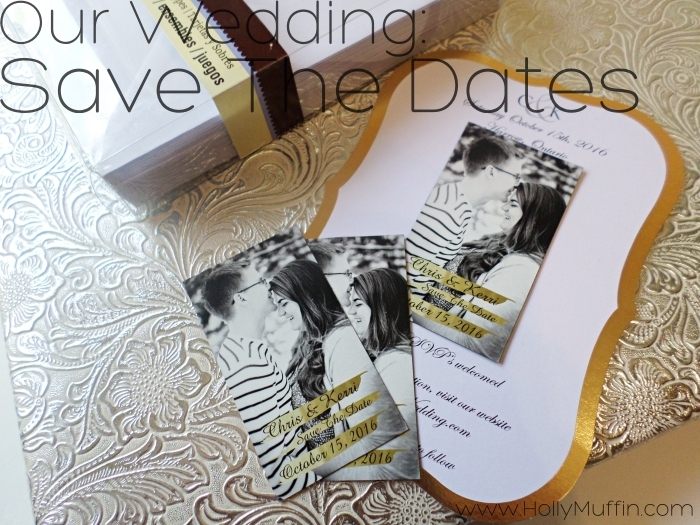 In the end, our DIY save-the-dates cost a total of $100 and look similar to ones that cost 4x more. I was extremely happy with the result! 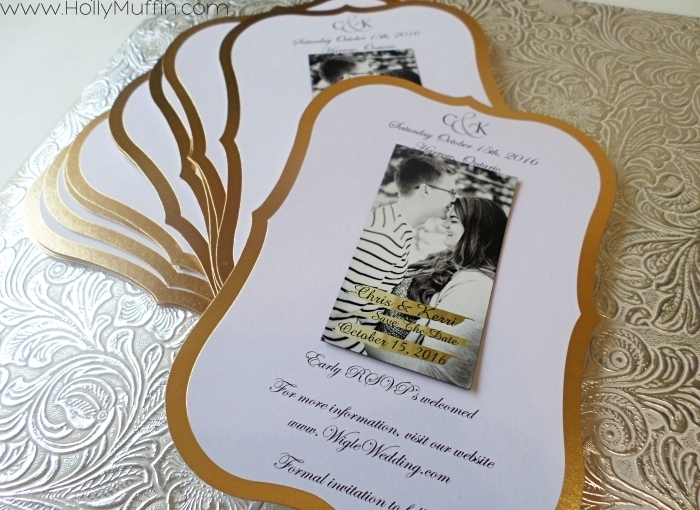 Is it weird that I love invitation making? For years, I had wanted our wedding at a hotel overlooking the Detroit river (the place Chris asked me to be his girlfriend and also proposed to me). Of course I had to be responsible and make sure we explored all options, so we received quotes from over 20 venues near us. Right away, it became overwhelmingly obvious that we were in trouble. My first choice locations were wayyyyy over budget. I’m talking over budget in base fee alone. Of course, that’s not including drinks, bar fees, and all of the other crazy fees. Did you know that there is a fee to play music in a hall in Canada? or a cake cutting fee? I didn’t. Those who know me know that I’m the last person in the world to ever consider a tent wedding, or even a barn wedding. I wasn’t willing to sacrifice the formal feeling, and I was heartbroken. Trying to shed some of my stubbornness, we began looking outside of the city. After looking at a few places, we decided to call a hall about 5 blocks from our home. We met with the coordinater to discover that this little club was actually more beautiful than most of the huge venues in the city, for half the price. I’m really glad that we explored our options, because this venue ended up being the perfect fit. Basically, moral of the story is don’t rule anything out. Be diligent and don’t overspend just because you don’t think you can find what you want. Explore many options. Dont give up. The truth is that if we would have chosen the venue that I was set on, we would have been way over our heads in terms of debt. I don’t regret the decision at all, because in the end…this is all for just one day. This post contains an affiliate banner for www.tinyprints.com, but all thoughts and opinions are my own. Our wedding is long over, so I think I’m well overdue in starting the series of posts surrounding our special day. I want to be very open and honest with these posts, in hopes of sharing the process of planning a real wedding on a budget. During the planning process, I found it difficult to find any appropriate online resources. Everything I found seemed irrelevant for my life here in Canada, way too expensive/out of reach, or too “Pinteresty”. Although there are some Canadian resources for wedding planning, nothing spoke to me. Truthfully, everything made me feel like our budget wasn’t big enough and that everything I wanted was completely out of reach. We started with a budget of $10,000 for 100 people. I’m a very resourceful and crafty person, so I figured that I could cut a ton of costs by doing things myself. As soon as we started booking vendors, it became obvious to me that our budget would never work for the wedding I’d always imagined. I couldn’t do everything myself, and truthfully I didn’t want to overwhelm myself by taking on too much. My first ah-ha moment happened when we quoted out food and drink. It turned out that food alone would take up over half of the 10k. I was blown away. After factoring in alcohol and the main vendors, our budget was shot. It was time to make an executive decision on how much we were really willing to spend. So, we did. We were set on a few things – open bar, formal venue and decor, and indoor ceremony. I did my research, made a giant spreadsheet, got quotes for over 100 vendors, and took my time to decide what we wanted and didn’t need. In the end, we ended up almost doubling our budget. The final number came in around $18,500. To be completely honest, even staying within our new budget was extremely difficult. I easily could have spent $50,000, but I had to be responsible and remember that this was all for one day. For a breakdown of how we applied our money, take a look at the infographic above.